While Americans have rightly groaned and rebelled against President Trump’s declaration of a national emergency over his precious wall, which would rob Congress of its constitutional authority over spending, he has also used another false declaration of national emergency―most recently last week―that has been mostly unnoticed. Every executive order that Trump has issued imposing economic sanctions on Venezuela includes a sentence declaring that the country is causing a “national emergency” for America and poses “an unusual and extraordinary threat to the national security” of the United States. The fact that these absurd claims have gone unnoticed in the major media shows how weak the rule of law is in the United States in the arena of foreign policy―as legal scholars have noted. This is especially true for aggressive actions by our government that kill people in other countries. And make no mistake about it: US sanctions on Venezuela are killing people, and have been killing people for some time, as opposition economist Francisco Rodríguez, the leading expert on the Venezuelan economy, has pointed out. There are no estimates of the death toll from the sanctions, but given the experience of countries in similar situations, it is likely in the thousands or tens of thousands so far. And it will get rapidly worse if the most recent sanctions continue. How do economic sanctions kill people? In general, they do so by damaging the economy. This includes loss of employment and income for people living on the margin, and, most importantly, reduced access to life-saving necessities such as medicines, medical supplies, and health care. In Iraq in the 1990s, for example, the number of children who died from the sanctions was in the hundreds of thousands. But the Venezuelan people have been even more vulnerable to US economic sanctions than Iraqis were. Venezuela is dependent on oil exports for almost all of the dollars the economy needs to import necessities such as medicine and food. This means that anything that reduces oil production is primarily hitting the general population by cutting off the dollars that both the private sector and government use to import goods for people’s basic needs, as well as for transport, spare parts, and most goods that the economy needs in order to function. The Trump sanctions of August 2017 imposed a financial embargo that cut Venezuela off from most borrowing. This had an enormous impact on oil production, which had already been declining. The rate of decline accelerated rapidly; during the year following the sanctions, it would fall by 700,000 barrels a day, about three times as fast as it had fallen over the previous 20 months. This post-sanction acceleration in the loss of oil production amounts to the loss of more than $6 billion. For comparison, Venezuela, when the economy was growing, spent about $2 billion per year on medicines. Total goods imports for 2018 are estimated at $11.7 billion. At the time of these sanctions, Venezuela was already suffering from a deep recession and balance-of-payments problems that necessitated a debt restructuring. To restructure the debt, the government has to be able to issue new bonds, but the US sanctions made this impossible. The Trump sanctions—both the August 2017 sanctions and now the new oil embargo—also make it pretty near impossible for the government to take measures that would end the hyperinflation, currently estimated at 1.6 million percent annually. To stabilize hyperinflation, you have to restore faith in the domestic currency. This would very likely be done through creating a new exchange-rate system and other measures that would require access to the dollar-based international financial system—but the sanctions preclude that. The sanctions imposed by the Obama administration in March 2015 (which also declared a “national emergency”) also had a very serious impact. This is well-known in financial institutions, but generally not reported in the major media, which treat these sanctions as they are advertised by the US government, as “sanctions against individuals.” But when the individuals are high-level government officials, for example the finance minister, the sanctions cause enormous problems, as these officials are cut off from necessary transactions in most of the world financial system. Financial institutions increasingly turned away from Venezuela after March 2015, as they saw the risks of lending to a government that the United States was increasingly determined to topple―and, as the economy worsened, looked more likely to succeed in doing so. The Venezuelan private sector was cut off from vital access to credit, which contributed to the unprecedented, indeed almost unbelievable, 80 percent drop in imports over the past six years, which has devastated this import-dependent economy. On January 23, the Trump administration announced that it was recognizing Juan Guaidó, currently head of the Venezuelan National Assembly, as “interim president” of the country. By doing so (together with politically allied countries), Washington basically imposed a trade embargo against Venezuela. This is because any revenue from oil sales to about three-quarters of Venezuela’s export markets―the United States and its allies―would no longer go to the government but to the “interim president.” Some temporary exceptions were carved out for US oil companies, but this embargo is still sweeping enough to rapidly multiply the economic damage, suffering, and death that the prior sanctions have caused. 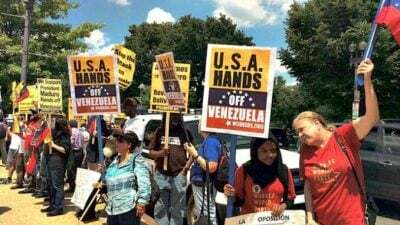 It is clear from their statements and actions that the Trump team―including National Security Adviser John Bolton, Senator Marco Rubio, and 1980s warcriminal and now special envoy to Venezuela Elliott Abrams―is not interested in a peaceful resolution of Venezuela’s crisis. They are not the type who worry about how many people will die along their road to regime change. The real question is why prominent liberals, such as Speaker of the House Nancy Pelosi, support this illegal and barbaric operation. Is it possible they don’t know what Trump and his sanctions are doing?